Hivve is a sustainable education ecosystem that gives back to the environment, generating more power than it uses. Hivve is lean and efficient, reducing a school’s reliance on mechanical heating and cooling systems which drain the budget. Hivve’s smart monitoring provides schools with timely data on energy use, preventing energy wastage and providing maximum control over energy demand. We’ve paid careful attention to all aspects of Hivve’s design, incorporating environmentally sustainable design elements and materials to minimise energy and reduce carbon emissions. Hivve’s integrated solar energy system generates enough power for its own energy needs and two other air-conditioned, traditional classrooms. Hivve is powered by clean energy, with zero emissions. 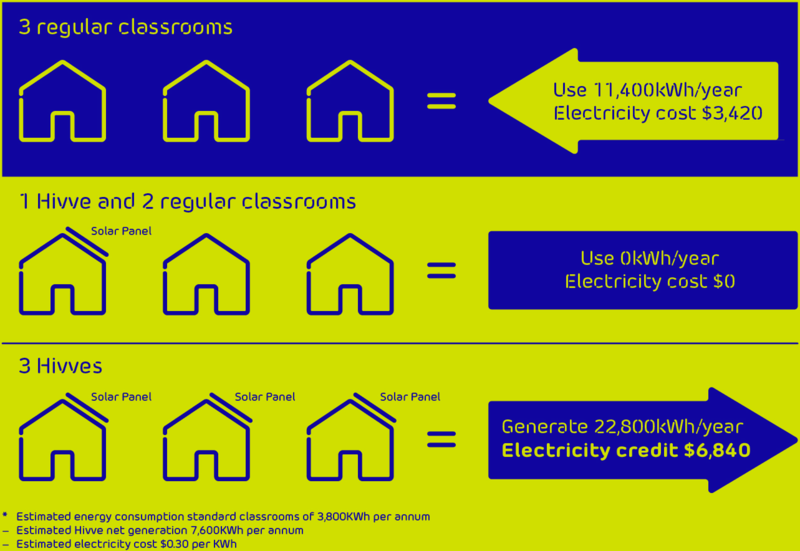 Hivve looks after itself: its integrated solar PV system generates enough energy to power itself plus two additional air-conditioned, traditional classrooms. Hivve reduces a school’s reliance on expensive coal-fired electricity and exposure to peak energy costs. And Hivve pays its way, contributing $3000 per year in energy savings. Hivve keeps working all year round – generating power even when school’s out. Hivve’s energy efficient design reduces school energy demand, lowers carbon emissions and saves money. We have balanced passive and active sustainable design elements in order to deliver optimal energy efficiency. We’ve maximised natural light and cross flow ventilation, used glazing and shade elements, thermally efficient insulation, energy efficient lighting, and a mixed mode cooling and heating system. And because of Hivve’s integrated smart monitoring control system, teachers can manage energy use at a touch of a button. Hivve delivers on environmental sustainability, from design to construction and operation. Our prefabricated, modular construction methods reduce waste, minimise energy use and create recycling opportunities. Environmentally responsible materials are carefully chosen to make Hivve thoroughly green. Hivve monitors energy use around the clock, giving schools the means to avoid wasting expensive energy. If someone’s forgotten to turn the A/C off, Hivve will let you know. Unlike traditional fixed buildings Hivve doesn’t stand still – it’s uniquely able to evolve and adapt as a school changes. Hivve is not just good for the planet, it’s good for the school budget too. Hivve classrooms generate enough solar energy each year to power itself and two other classrooms.